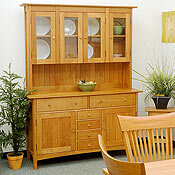 New England Wood Chatham dining room furniture including sideboards and matching glass hutch tops. Available in Small, Medium and Large sizes. Choice of solid maple, cherry or walnut. 72'H x 61'W x 20'D. Available in solid cherry, maple or walnut wood. The beautiful craftsmanship and quality of this sideboard and glass hutch top adds a classic and elegant touch to your dining room. Sideboard includes dovetail drawers and cabinet doors for ample storing for placemats, candles, dishes and other dining items. The matching glass hutch top is accented with four glass doors that open to two shelves, both with grooved bottoms for displaying your favorite dishes and china. Exceptional quality and care is used during every step of the construction process, so you can be certain these dining pieces will remain a cherished part of your life for years to come. 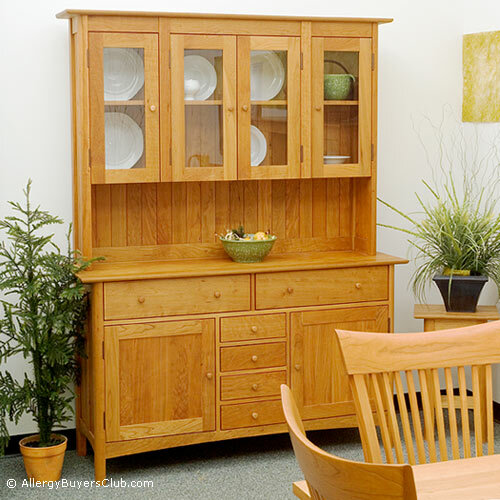 New England Wood elegant dining room sets are bench-crafted with the caring techniques of experienced craftsmen and the greatest attention to quality control. This begins with the careful selection of wood that matches in color and grain. These sideboards and glass hutch tops are securely joined together with mortise and tenon joints to gain the superior strength and flexibility of movement allowed when one block of wood is inserted into another. Traditional solid wood drawers, dovetail construction and smooth steel glides for durability is a choice that will result in the most durable, long-lasting furniture.